After only three days of talks in Geneva, the United States and Russia have found a way to see eye to eye. U.S. Secretary of State John Kerry said Saturday that he and his Russian counterpart, Sergey Lavrov, have reached an agreement under which Syria has one week to catalog its chemical weapons, and until mid-2014 to eliminate them. The deal, reached on the final day of negotiations in Switzerland, gives Syria a week to submit a "comprehensive listing" of its chemical arsenal, and until November to allow United Nations inspectors access to the sites. The complete destruction of the stockpile has to be complete by the middle of next year. "We have committed to a standard that says, 'verify and verify'. Providing this framework is fully implemented it can end the threat these weapons pose not only to the Syrian people but also their neighbors," Kerry said. 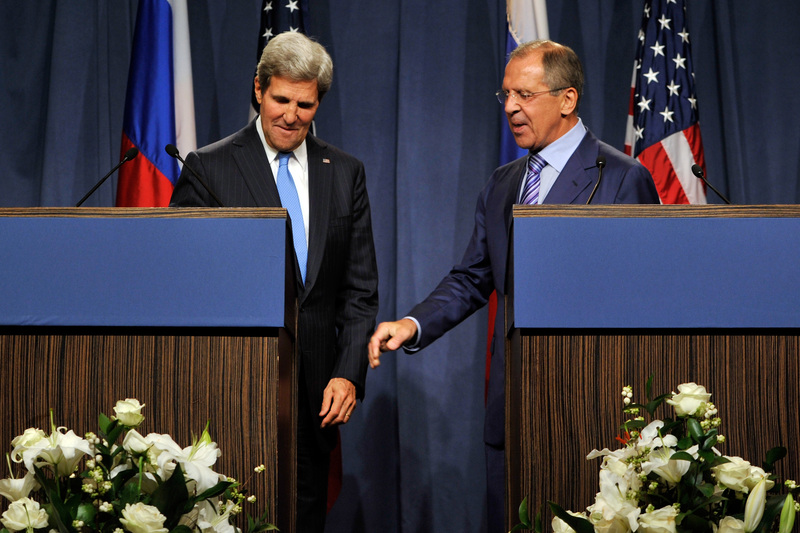 The Russian Foreign Minister said their decision was based upon "consensus and compromise". Although both Kerry and Lavrov agreed that failure to comply would lead to Syria's being referred to the U.N. Security Council, it wasn't clear what sanctions might be imposed. "Any violations of procedures ... would be looked at by the Security Council and if they are approved, the Security Council would take the required measures, concrete measures," Lavrov said, adding: "Nothing is said about the use of force or about any automatic sanctions. All violations should be approved by the Security Council." Last week, Russia had balked at the idea of a U.N. Security Council resolution that would have authorized the full use of military force if Syria failed to follow through with its promises. "The world will now expect the Assad regime to live up to its commitments ... there can be no room for games. Or anything less than full compliance by the Assad regime," Kerry said. The agreement comes only two days after Syrian President Bashar al-Assad began raising his demands, saying no deal would be had while the U.S. continued to threaten the region and arm the rebels. "When we see that the U.S. genuinely stands for stability in our region, stops threatening us with military intervention and stops supplying terrorists with weapons, then we will consider it possible to finalize all necessary procedures and they will become legitimate and acceptable for Syria," Assad said Thursday. He also said he would only honor anti-chemical weapons agreements if all the other countries in the region did so also, adding that "the first country to do so [should be] Israel because it possesses nuclear, chemical and biological weapons — all types of weapons of mass destruction." Kerry now heads to Jerusalem to continue talks about Syria with Israeli Prime Minister Benjamin Netanyahu. From there he'll go on to Paris on Monday, where he'll hold discussions with French Foreign Minister Laurent Fabius and British Foreign Secretary William Hague. The U.S., France and Britain, along with Russia and China, form the five permanent members of the UN Security Council.